This pages covers the steps required to release the BES software for Hyrax. We now depend on the CI/CD process to build binary packages and to test the source builds. 1.3.1 Update the ChangeLog file. Tip: If, while working on the release, you find you need to make changes to the code and you know the CI build will fail, do so on a release branch that you can merge and discard later. Do not make a release branch if you don't need it, since it complicates making tags. We release using the master branch. The code on master must pass the CI build. and compare that using diff on the previous release's library. No interfaces changed, only implementations (good): ==> Increment REVISION. Interfaces added, none removed (good): ==> Increment CURRENT, increment AGE, set REVISION to 0. Interfaces removed or changed (BAD, breaks upward compatibility): ==> Increment CURRENT, set AGE and REVISION to 0. Edit the configure.ac and update the version values to the new ones. Use the script gitlog-to-changelog (which can be found with Google) to update the ChangeLog file by running it using the --since="<date>" option with a date one day later in time than the newest entry in the current ChangeLog. If you're making the first ChangeLog entries, then you'll need to create the ChangeLog file first. Tip: When you're making the commit log entries, use line breaks so ChangeLog will be readable. That is, use lines < 80 characters long. To update the NEWS file, just read over the new ChangeLog entries and summarize. Determine the human version number. This appears to be a somewhat subjective process. Edit each of the Affected Files and update the human version number. It's helpful to have, in the NEWS file and the Web site and the release notes, a list of the Jira tickets that have been closed since the last release. The best way to do this is to goto Jira's Issues page and look at the Tickets closed recently item. From there, click on Advanced and edit the time range so it matches the time range since the past release to now, then Export that info as an excel spreadsheet (the icon with a hat and a down arrow). YMMV regarding how easy this is and Jira's UI changes often. In the RPM .spec file, update the dependencies as needed. No interfaces changed, only implementations (good): Increment REVISION. Interfaces added, none removed (good): Increment CURRENT, increment AGE, set REVISION to 0. Interfaces removed or changed (BAD, breaks upward compatibility): Increment CURRENT, set AGE and REVISION to 0. See How to see the scope of API/ABI changes in C++ sources below for gruesome details. Often basic knowledge of the edits is good enough. Goto those directories and update the ChangeLog, NEWS, README, and INSTALL files (even though INSTALL is not used by many). Update the module version numbers in their respective Makefile.am files. Commit and Push these changes. Commit and push the BES code. Wait for the CI/CD builds to complete. You must be working on the master branch to get the CD package builds to work. git tag -a version-<numbers> -m "Version <number>"
git tag -a hyrax-<numbers> -m "Hyrax <number>"
NB: Instead of tagging the HDF4/5 modules, use the saved commit hashes that git tracks for submodules. This cuts down on the bookkeeping for releases and removes one source of error. On the Releases page click the 'Tags' tab. On the Tags page, locate the tag (created above) associated with this new release. Click the ellipses (...) located on the far right side of the version-x.y.z tag 'frame' for this release and and choose Create release. Click Publish release or Save draft. When the release is made on GitHub the source tar bundle is made automatically. However, this bundle is not the one we wish to publish because it requires people to have autoconf installed. Rather we want to use the result of "make dist" which will have the configure script pre-generated. All you need do is build the tar file using make list, sign it, and push (or pull) these files onto www.opendap.org/pub/source. Go to the bes project on your local machine and run make dist which will make a bes-x.y.z,tar.gz file at the top level of the bes project. Download the source tar bundle and signature from www.opendap.org. Look at the 'upload' page. If there is nothing there (perhaps because you are not jhrg or whoever set up the connection between the BES project and Zenodo) you can use the search bar to search for bes. 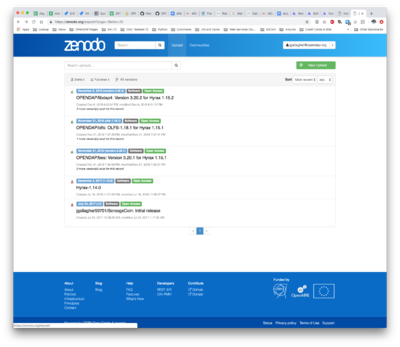 Since the libdap, BES and OLFS repositories are linked to Zenodo, the newly-tagged code is uploaded to Zenodo automatically and a DOI is minted for us. Click on the new version, then click on the DOI tag in the pane on the right of the page for the given release. Copy the DOI as markdown from the window that pops up and paste that into the info for the version back in Github land. Also paste that into the README file. Commit using [skip ci] so we don't do a huge build (or do the build, it really doesn't matter that much). This page was last edited on 22 March 2019, at 17:15.